I know that you're all searching for a longer life time battery for your Smartphones to last few more days for your long trip, and you'll get surprised with the very high capacity batteries available on online markets like Ebay, for example the original battery for the Samsung Galaxy S3 is 2100mAh but on Ebay you'll find up to 4080mAh with same size! Just don't believe all these craps, they're all fake except for extended bigger battery size. Samsung is already spending billions of dollars to make the optimal battery for the smallest size available, so you think these very small companies are better than the Big Boss Sam ? Beside, Physically it's impossible to squeeze more mAh into the same space, and if you want to check this by your self, just remove the gold external cover and you'll get surprised, its only 50 % to 60% mAh for what you paid for ! 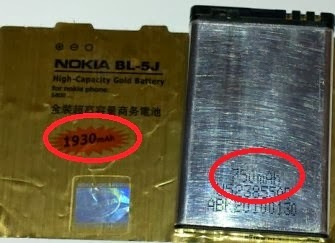 Check out the picture bellow for a Nokia phone battery. This is an example for the Galaxy S3 4080mAh from Ebay, as you can read they say that its safe to use and better than the original one, "This brand-new battery offers a high capacity of 4080mAh boosting", so dont bother your self and loos time and money, if you want more capacity just buy a bigger extended battery like ZeroLemon and/or buy an USB standalone charger. Conclusion, BUY THE ORIGINAL OEM Battery, I wish this will help you guys before spend your money.